Rupture Disks - Beacon Distributors Inc.
Rupture Disks are designed for over pressure protection of excess pressure in plastics processing machinery and are designed to instantaneously rupture when the pressure has passed a predetermined pressure point. 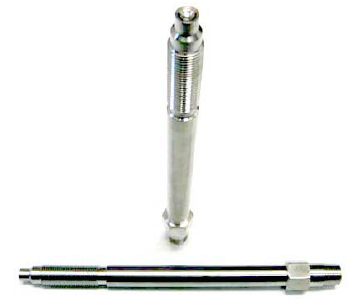 These are available at most pressure ranges varying from 1,500 PSI to 15,000 PSI and most thread types ranging from 1/2-20 UNF 2A to M18X1.5. As seen in the pictures below these are available in a variety of lengths and configurations. Discharge connections can be added. 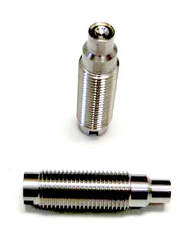 Also, available are solid steel plugs that are used to fill previously used holes and do not provide pressure relief. For further information see below for specifics for varying models. 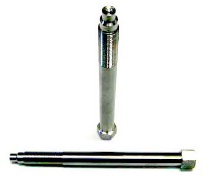 - Burst pressure ranges from 1,500 psi to 15,000 psi, however, others are available.